Material lifts are lightweight, compact and extremely portable, making them a valuable tool for a wide variety of applications. A material lift usually is comprised of a base that supports a vertical post. The post typically holds a pulley system, a winch, and a platform to help raise and lower various materials. 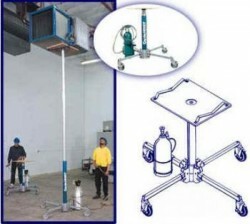 Other models employ carbon dioxide tanks, or compressed air, to hoist heavy loads. And some models come with a boom option, which allows for the handling and lifting of up to 500 lbs. Their exceptional light weight and sturdiness make it simple for one person to set up, utilize and store. Most models, when compacted, can be easily stored in a pickup truck or service truck. Material lifts, in most settings, are used to lift and install various materials, including air ducts, plumbing tubes, drywall and all sorts of electrical components. The lifts are also commonly used for shipping and receiving tasks and to move heavy material to and from shelves. In addition, their hoist systems make it easy for a single person to lift heavy materials and place them for installment. Most models can be set up in mere minutes and come with non-marking wheels essential in preventing damaged floors. A variety of accessories, moreover, make material lifts adaptable to a seemingly endless amount of tasks, indoor and outdoor. 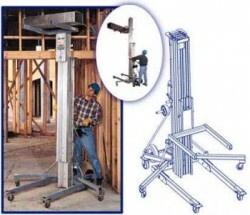 Material lift forks can be adjusted and extended for awkward-sized loads. And platforms that fit over the forks come in various sizes, allowing for the movement of heavy objects. 12' 18' Powered by CO(2) Heavy duty design, Quick setup. Easy to operate. 12', 18', 24' Heavy duty design, Quick setup requires no tools. 20' 25' The ideal stage hand! 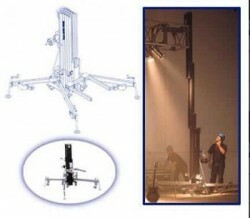 Tower is ideal for lighting, sound systems and stage scenery. 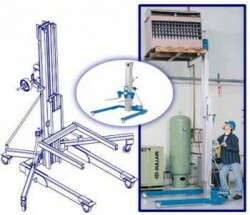 Material lift for construction & industrial applications. Heavy duty design, Quick setup. Many attachments available.